These Custom-Imprinted Stadium Cups are perfect for bars, restaurants, clubs, fraternities, sororities, sporting events, promotions, and much more. One of our most popular cups is our Mood/Color Changing Stadium Cups that change color when your favorite ice-cold beverage is inside. 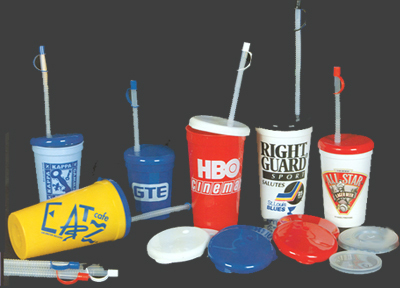 All Stadium Cups are available in many colors and with over two-dozen imprint colors. You can even have Full Color Custom Stadium Cups with your photograph digitally printed on each cup! Cup Smooth $0.87 $0.55 $0.45 $0.39 $0.35 $0.34 2½" 2¾" 2½" x 7"
Cup, Smooth $0.89 $0.57 $0.47 $0.41 $0.37 $0.36 2¾" 3½" 2¾" x 8½"
Cup, Fluted $0.89 $0.57 $0.47 $0.41 $0.37 $0.36 2¼" 3½" 2¼" x 8½"
Cup, Smooth $0.97 $0.63 $0.49 $0.45 $0.41 $0.39 3½" 3½" 3½" x 8½"
Cup, Fluted $0.97 $0.63 $0.49 $0.45 $0.41 $0.39 3" 3½" 3" x 8½"
Cup, Smooth $1.05 $0.69 $0.55 $0.49 $0.45 $0.43 4½" 4" 4½" x 9¼"
Red, Royal Blue, White, and Yellow. Our Flyer Lids with Straws and Standard Clear Lids (with or without Straw Holes) complete your Custom Imprinted Stadium Cups. The Flyer Lids can be used as Mini Frisbees that enliven any event. All three Flyer Lid sizes (16, 22, and 32 ounces) are available in the following colors: black, red, royal blue, and white. Color Changing Stadium Cups - These Change Color with Ice-Cold Liquid! 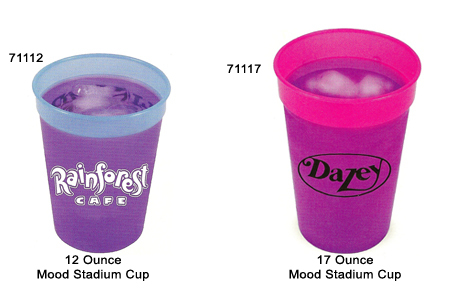 71112 12oz Mood Stadium Cups: 0.79 0.69 0.65 0.63 0.59 3-1/2" 2"
71117 17oz Mood Stadium Cups: 0.97 0.73 0.69 0.67 0.65 3-7/8" 3"
12 oz. Cups: Blue to Purple, Yellow to Green, Frosted to Blue, and Pink to Purple. 17 oz. Cups: Pink to Purple, Blue to Purple, Yellow to Green and Orange to Tropical Red. "Frosted Assortment" also available for 17 oz. cups: Frosted to Blue, Frosted to Orange, Frosted to Pink, Frosted to Red and Frosted to Purple. It's easy to get started with your Custom Cups - simply call 1-800-233-0828, and then e-mail your camera-ready artwork to graphics@kardwell.com (you can also mail your design). Production and shipping time is 3-4 weeks. Rush delivery is available for an additional charge.